Purple and pearl make up look. 1 .Firstly I applied Too Faced shadow insurance to my eyelids and blended up to the brow bone. 2. I applied a shimmery pearl eyeshadow from my Sleek I-Divine palette all over the lid and into the crease with my Real Techniques shading brush. 3. I then applied the deep purple eyeshadow from the same Sleek palette to the outer V and blended it into the crease well. 4. Following that, I applied Shadowy Lady by MAC to the outer V to intensify the purple. 5. For the brow bone I used Shroom by MAC as a highlighter and also used it in the corner of the eye to help brighten everything. 6. 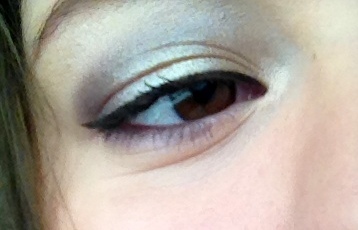 I then lined my eyes with a black waterproof pencil eyeliner by Barry M.
7. 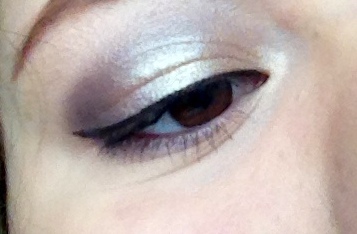 I also lined my eyes with a black liquid eyeliner also by Barry M, and winged it out a little. 8. Finally I curled my eyelashes and applied MACs Zoom Lash Mascara to the top and bottom lashes. < Coming up: Interview with plus size model Lexi Placourakis!